Some smaller municipalities, like their bigger counterparts, are welcoming the new transport mode when they see the popular demand, sometimes drawing new faces and encouraging even long-time residents to explore some areas that might be too traffic-packed by car or tedious by foot. It’s seen as a potential boom for local businesses, one that has a lower carbon footprint, reduces congestion and roadway wear-and-tear. Theoretically speaking, scooters should be safer than cars, with their smaller profile and maximum speed of 30 mph. And the more they can reduce people’s gas-guzzling motor vehicle dependence, the less noise and air pollution there will be – and traffic congestion, which can directly lower any city’s crash rate. Some electric scooter advocates have suggested cities that truly want to be safer should cap the number of cars rather than the number of scooters. Our Gary, Indiana injury lawyers know that while colliding with a scooter is generally going to cause less hurt for all road users compared to a crash with a car, one could still end up in the hospital with serious injuries – particularly if a scooter strikes a pedestrian, bicyclist or someone else on a scooter (especially with no helmet). Electric scooter interaction with motor vehicle traffic. This summer was especially dangerous because the scooters’ presence caught the city – and other road users – by surprise. Without clear regulation in place, no one seemed quite sure where they belonged on the road (and unpredictability is never a safe scenario in moving traffic). Some scooters tried to keep pace in traffic lanes with cars, others took to pedestrian paths and sidewalks. Indianapolis has since prohibited scooters on sidewalks because of both their size and speed. The city determined the devices are best suited to bicycle lanes (the maintenance and expansion of which scooter companies are chipping in. This does, however, put e-scooter riders at the same risk as cyclists for “dooring,” which occurs when a door from a parked car swings open into the bike path lane. Operators must also obey all traffic laws, yield to pedestrians and sign an agreement promising to abide Indianapolis Ordinance for the devices. Rides are also limited from dawn to dusk, when the company collects them from their last location, using GPS. Lack of uniform e-scooter safety features. They are now required to have lights, a speed indicator and horn or bell. No helmets. Without an enforced requirement to wear helmets, few did. Serious injuries resulted. Just in September (the last month of Indianapolis’ scooter ordinance enforcement grade period), city emergency workers responded to 22 e-scooter injuries, officials saying many of those involved riders simply falling down on their head and face after losing control, though some did include collisions with motor vehicles. (Although no e-scooter deaths have been reported in Indiana due to such incidents, a man in D.C. was recently struck and killed by an SUV while riding one). Operators in Indianapolis are now all “encouraged” to ride helmets. Some have stated they intend to press for a helmet requirement. Scooter rider inexperience. Most e-scooter riders across the country this summer had zero practice before plucking them from their last parking spot and taking them out for a spin in dense urban traffic – a particularly perilous journey at top speed. E-scooter operators now must be at least 16, have a valid driver’s license and avoid being under the influence of drugs or alcohol while operating. Insurance. Indianapolis required the scooter share services to carry indemnification insurance to cover the city for costs the city would incur if held liable for an Indiana scooter accident. Dockless e-scooter parking hazards. To reduce the risk of a collision with a scooter that’s been carelessly dropped somewhere, the city prohibited electric scooter parking in numerous places, including ramps, curbs, handicapped parking, loading zones and driveways. Each violation will cost the company $25 (which it is then free to recover from the person who rented if they can be tracked). Falling behind on maintenance. Some e-scooter providers are facing litigation for allegedly failing to maintain their fleet. The scooters get almost daily use, so it’s important that companies like Lime and Bird make sure the tires are inflated, the brakes aren’t worn, the bells are working and the motor is in good order. Failure to do so that results in a scooter crash could be grounds for an injury lawsuit. Ultimately, the question of potential liability for any electric scooter accident in Indiana is going to come down to one that is the same for so many other crashes: Who failed to follow the law? Who had a responsibility to use reasonable care toward someone else – either statutory, as with driver-to-driver, or special relationship, as with business-to-patron – and failed? There isn’t yet any Indiana law on electric scooters and city ordinances can vary. Underinsured motorist police for autos, will cover insureds in a bicycle crash. But is an e-scooter a bicycle? More like a motorcycle? The exact coverage you might receive will depend on the precise language of your individual policy (or that of the other person who struck you). It’s important to discuss your legal options with an experienced Indiana injury lawyer. 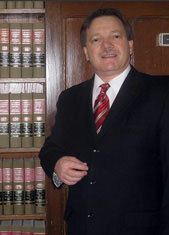 Indiana Injury Attorney Burton A. Padove handles personal injury claims throughout northern Indiana, including Highland, Gary, Munster and Hammond. Call Toll Free 877-446-5294.